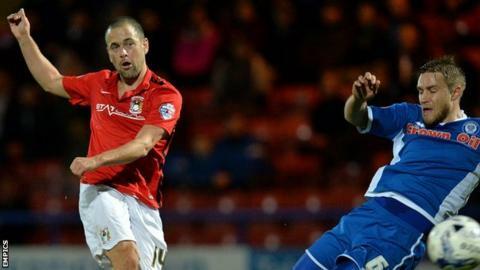 Coventry City manager Tony Mowbray says Joe Cole was held back to face Barnsley at the Ricoh Arena on Tuesday after leaving the on-loan Aston Villa man out of Saturday's win over Peterborough. The former Chelsea and England winger has so far been nursed though matches since arriving on a 35-day loan. He played for 58 minutes on his debut at Rochdale, before going off at half-time in the 2-2 draw at Swindon. "We've got to choose a balance with Joe Cole," Mowbray told BBC Sport. "We're picking and choosing the games he plays, so come along on Tuesday night and watch Joe Cole. He'll be ready for that." Depending on how Coventry do in Saturday's FA Cup first-round tie at home to their former landlords Northampton Town, the 33-year-old may have just four more games left to play in before his loan expires. Coventry City are unbeaten this season at the Ricoh Arena, having won five of their seven home matches. It is in marked contrast to when Mowbray came in last season - the Sky Blues won just once in seven home games following his appointment in February. Saturday's comeback victory kept the Sky Blues fourth in League One, and if they beat a Barnsley side who have lost all of their last six games, Mowbray's side would move to within a point of top spot. It was the second season running that City have come from two goals down at half-time to beat Posh 3-2. Mowbray continued: "It was crucial for the players because, if they know they can beat one of the better teams in the division like that, it's a great confidence booster." The only downside is the club's lengthening injury list, with defender Jordan Willis having suffered a knee problem on his return to action last week to add to the loss of long-term absentees James Maddison and Reda Johnson. "We've had some very bad fortune with our injuries this season," Mowbray told BBC Coventry & Warwickshire. "They've all been contact injuries in tackles or collisions."